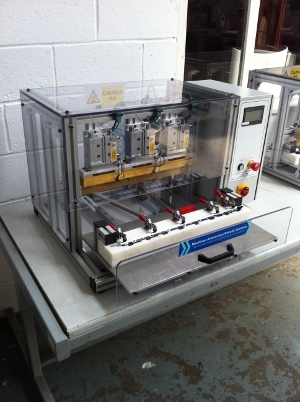 This photograph shows our M-HSTM multi-head heat staking machine with HMI (human-machine interface). It is heatstaking an LED lit interior door trim made up of 3 separate mouldings for a car manufacturer. There are four machine involved - one each for left hand and right hand front and rear doors.